The Quality Center's site admin supports backing up and restoring the projects as following the below screenshot procedure. The output file will be a .qcp extension file. Restoring a .qcp file that is smaller than 2GB is a straight forward process. 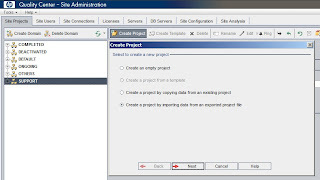 As below screenshot just selecting Create Project and then checking the last option will be enough. In the next entry i am going to describe how to restore a qcp project file that is bigger than 4GB. If you are managing an important QC project, making this backup process as a scheduled job is a good option rather than backing up database scheme and file system. You can use following VB code and define a scheduled job on Windows Task Manager that triggers this script. To make sure that this code runs on your host first you have to open the siteadmin and qc application to install the client components like OTAClient and SAClient. By using this script you can define the domains and projects those you want to back up. Before starting the backup process the script opens a defect on a different project (SUPPORT:QC_BackupProject). When the job completes the defect will be Fixed and Closed and then the alarm mail will be sent. The script must be copied on the backup server and a scheduled task must be defined by using Windows Task Manager. 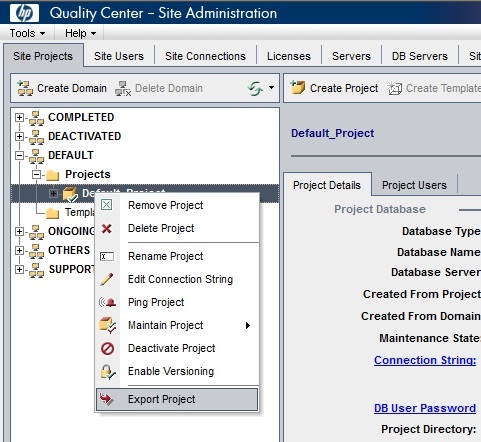 v_fileName = "D:\DO_NOT_REMOVE\QCBACKUPS\" & v_date & "_" & v_project & ".qcp"
sa.SendMessageToProjectConnectedUsers v_domain, v_project, "This project is going to be deactivated due to maintenence." fixAndCloseDefect bugId, v_fileName & ": " & round((f.Size/1024)/1024,2) & " MB"
To manage the old backup files you can define another job for the following script (deletes qcp files those are older than 10 days). To accomplish this you have to put this piece of code in a batch file and define another scheduled job that calls this batch file. forfiles.exe executable file must be in the same directory with the batch file. forfiles.exe /p D:\DO_NOT_REMOVE\QCBACKUPS /m *.qcp /d -10 /c "cmd /c del @file"
Error: ActiveX component can't create object: "SAClient.SaApi"
This VB code uses the dll files and componenets (like OTAClient and SAClient) that are installed while you open the QC application. 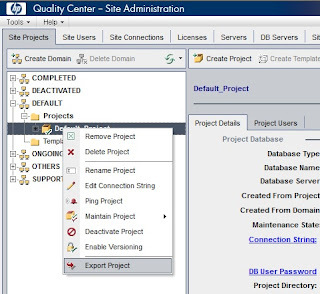 Can you try to open the QC application and Siteadmin page with the Internet Explorer to make sure that client components and dll files installed? This is just a workaround solution for making backups scheduled and put the backup files on another server. Incase of any emergency server problem you can restore from these backup files easier than restoring the filesystem and database. HP advises you to backup your filesystem and DB server separetely. What is the size of the project you want to export? 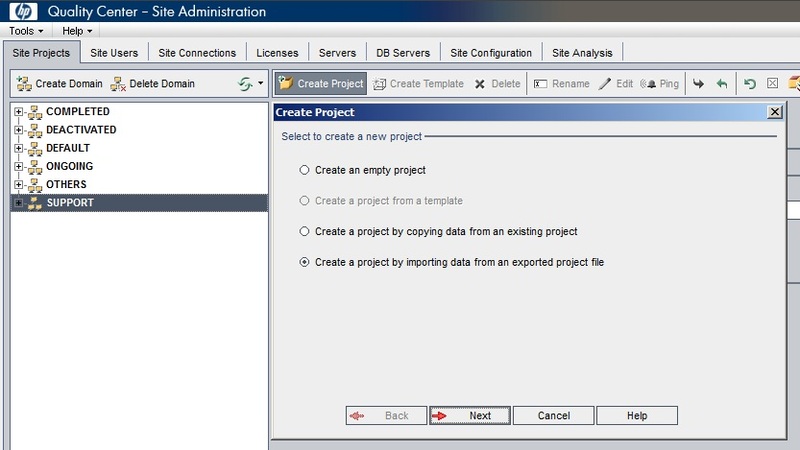 To reduce the project size first you've to move the repository files to somewhere else while project is deactivated. Then you can export the project. Be carefull not to activate the project until you put the repository files to its original directory.